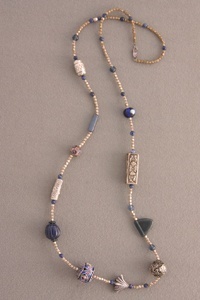 I have always LOVED jewelry of all kinds so I took a few classes to learn to make things for myself and gifts. Soon there were new and more exciting things I wanted but I had so many interesting pieces already. The only solution was to sell something to make room for the new. 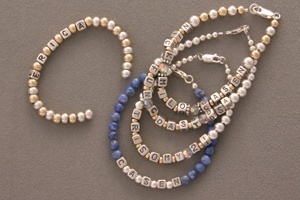 Brenda's Jewels was born (thanks to my husband for the name) and the rest is history. 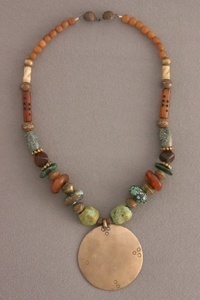 Brass African pendant with old African brass beads, Horn, Turquoise, Carnelian, Malacite and Bone. Sterling and Gold filled handmade beads. 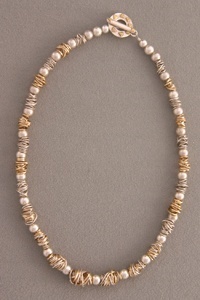 Artist content copyright by Brenda's Jewels.